The talk of the combat sporting world this weekend was the Khabib vs. Conor McGregor UFC fight, which featured Khabib picking McGregor apart before submitting him in the fourth round, then suddenly jumping out of the octagon cage and into the crowd to attack Dillon Danis, a member of McGregor’s team who was sitting cage side and allegedly taunting Khabib. Chaos ensued afterwards and members of Khabib’s team jumped in the cage to attack McGregor. Suspensions will likely be given out, loss of purse and titles are also a possibility. The sports world was divided. Were Khabib’s actions justified? Were his actions unexpected? In order to attempt to understand Khabib, one first has to understand his background and where he is from, something that he was evidently trying to explain in his post fight explanation. Khabib is from Dagestan, a Russian republic. It has been the forefront of Islamic Insurgency and ethnic tension since the 1990s. It borders Chechnya, the location of a severe conflict with Russia that often featured Chechen fighters infiltrating Dagestan to call for Jihad. Khabib is a devout Sunni Muslim and well educated. He speaks several languages and is very proud of his culture and heritage. Insults aimed at his religion or nation are not taken likely. I’m not arguing that Khabib is a terrorist or that he supports armed violent jihad, but pointing out that disrespect against his religion is taken very seriously. So should we have been surprised by Khabib’s actions? Well, if you had some general knowledge about the region he is from, probably not. McGregor is notorious for his trash talking, but when he insulted Khabib he questioned the support Khabib has in his nation, mocked Khabib by offering him alcohol even though he’s a Muslim who does not drink, and called his manager a terrorist rat. Khabib has been exposed to religious warfare and terrorism, and to lump him and his team with real terrorists was undoubtedly an insult that he could not ignore. 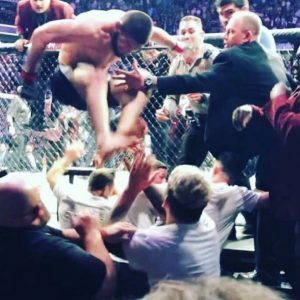 Khabib claims Dillon Danis hurled Muslim insults at him after the fight and that’s why he jumped over the fence, a claim Danis denies. But nobody should have been surprised that Khabib was still fired up after his fight with McGregor was over. “I think that for Khabib, the most severe sanctions would be my regard. I am going to regard this severely. I warned him. For me, the most important thing is discipline. You can do whatever you want in the octagon, but beyond its barrier-this is the border separating civilians, there are children, women, bystanders. Now for the million dollar, or two million dollar question. Were his actions justified? Pre-fight trash talk has been a part of combat sports for years. McGregor and Mayweather’s trash talk was probably more entertaining than the actual fight itself. But even though Mayweather and McGregor insulted each other greatly leading up to the fight, they were able to be cordial in the post fight interviews. It’s difficult to find too many situations where a fighter leaped into the crowd immediately after a fight to engage someone in the crowd. But there has been several situations where members of a boxer’s team jumped in a cage to start a brawl, and they were usually dealt with by the commission harshly. Roger Mayweather jumped in the ring when Floyd fought Zab Judah and was hit with a low blow and a punch behind the head. An all out melee ensued when members from both camps entered the ring and brawled. Afterwards, Yoel Judah was fined $100,000 and had his license revoked for a year. Roger Mayweather was fined $200,000 and had his license revoked for one year. Leonard Ellerbe was fined $50,000 and had his license revoked for four months. Even Zab Judah received a fine of $350,000 and had his license revoked for a year. Another example of a brawl happening in boxing was during the riot during the first Riddick Bowe/Andrew Golota fight. The fight was stopped after Golota landed several low blows on Bowe after repeated warnings. Members of Bowe’s security team jumped in the ring and went after Golota. Rock Newman, Bowe’s manager and promoter, was suspended for a year and fined $250,000 for the incident. More recently, one would have to look at the fight between Jose Uzcategui and Andre Dirrell, which featured Leon Lawson Jr., the Uncle of Dirrell, sucker punch Uzcategui. Lawson was suspended by the Maryland State Athletic Commission and faced criminal charges as a result. Of course, one of the most famous post fight brawls or sucker punches was when James Butler sucker punched Richard Grant on ESPN after he lost his fight. He was charged with assault and suspended. In fact, he served four months at Rikers Island as a result. Were his actions, jumping into the crowd to attack bystanders, justified? Precedent by athletic commission for boxers and members of their team behaving poorly and attacking fighters after a sanctioned fight is over are usually dealt with harshly. There really isn’t any specific precedent to determine if the actions of Khabib were justified, but it appears likely that the commission won’t find any justification for a fighter to jump into a crowd to start a wild brawl, and will also likely deal with him harshly.